Backpacked this little trail with a difference over a very hot few days last July. 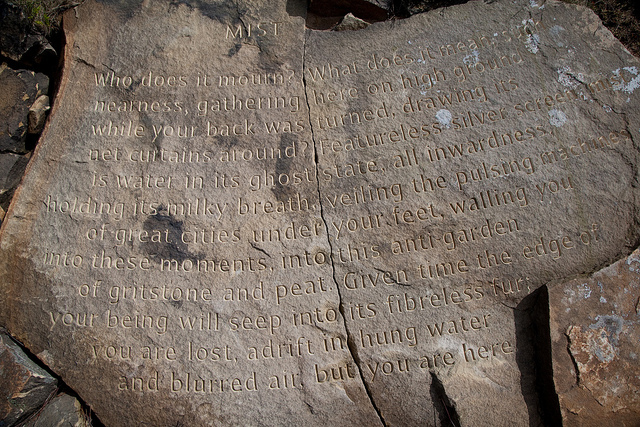 The Stanza Stones Trail runs 50 miles from Marsden to Ilkley in Yorkshire, connecting a series of large stones carved with poetry which have been placed on the moors at points along the way. Some are right next to the route, others hidden away. A couple take a bit of finding. 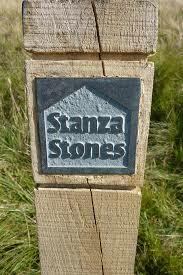 The trail itself uses bits of the Pennine Way and other routes in the area. Worth doing just for the poetry alone, which itself is superb, and it made for a nice easy weekends backpack close to home. I can vouch for the beer around here too, plenty of Timothy Taylors Landlord and there’s a great micro brewery at the start in Marsden…..and let’s not forget Betty’s Tea Rooms in Ilkley. ← TGO Challenge 2014 – Vetters comments back. Our survey says WET !